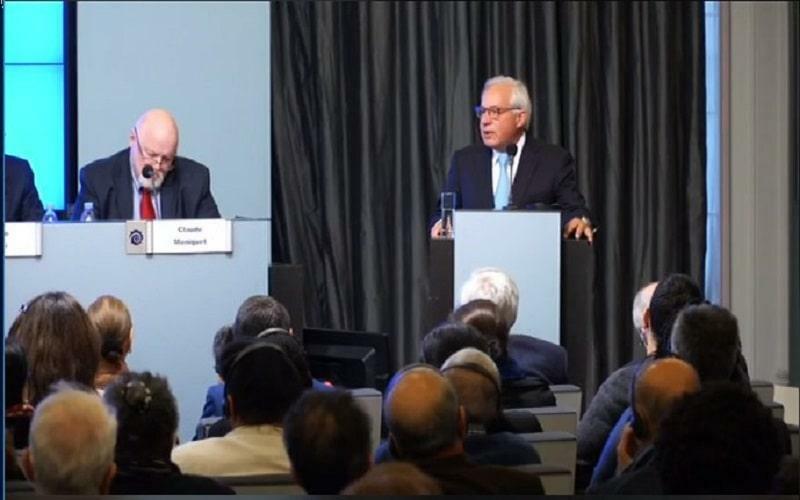 Robert Torricelli: if the Ministry of Intelligence is not a foreign terrorist organization then Iranian diplomat who have been arrested and extradited should not be prosecuted. First. In the most sincere words that I can utter, on behalf of my family and myself, I would like to sincerely thank the law enforcement officials of Belgium and of Germany, the governments of France, Germany, and Belgium, for their professionalism, their commitment to duty. I am well aware that my being alive and not being hurt, Is in many ways due to them, and I will always, always be grateful. Many, many distinguished people are alive today and without serious injury, because of the professionalism of law enforcement. Thank you, any of you can hear my words, thank you very, very much. There’s a saying in American politics that sometimes hope and reality collide. We had all hope for a long time that the Iranian regime would reform and transform itself. Sometimes the evidence becomes too unmistakable. What happened on June 30, was part of a pattern, not an isolated event. Weeks before, American and Albanian intelligence uncovered a plot to plant a bomb outside a dining hall in Tirana, were Iranian refugees would have been gathering to eat. Weeks after the alleged planned attack on June 30th, American law enforcement uncovered surveillance activities in the United States, where Iranian intelligence was monitoring Iranian refugees and sites occupied and owned by Americans of the Jewish faith. There is any merging pattern of Iranian activity in the western world of terrorist plans and actions. It is not a coincidence. This is what happens when despotic regimes are under enormous political pressure at home and feel threatened by their own people. It is a pattern well recognized in history. For nine months hundreds and then thousands of people in small towns and cities across Iran have been demanding to reclaim their future, to end the despotic regime and restore democracy in Iran. The casualties have been appalling. Thousands have been jailed, hundreds have been executed. The loss of life is appalling. The Iranian regime is acting in the only way that it knows how. It cannot blame itself for the poverty of the Iranian people, they will not prosecute its own leaders for the torture and abuse and the imprisonment, so it blames those who protest, arresting those who would speak freely on the streets of Iran and those in the expatriate community who still love their homeland, want it to be free and prosperous. These terrorist actions are a manifestation of that frustration. That doesn’t explain it, it doesn’t justify it, but it does provide a warning. For a long time your opinions, like Americans, have believed that we were protected against terrorism by despotic regimes. Because the political, the economic and even the military cause, of conducting terrorist activities in our cities and towns were so great that no one would dare do it. Indeed for a long time, that policy held true. It was tested by Gadhafi, in his nightclub attack in Berlin. And there was a firm military response making clear that state-sponsored terrorism would not be tolerated, among nations of the NATO alliance. It is now being tested again. The Russians have tested it in the streets of London, with the poisonous attack. And now is being tested by the Ministry of Intelligence and the regime in Tehran. The question is what is it we do with this emerging pattern, recognizing this is not some rogue action there have now been three uncovered terrorist actions in three months. All traceable to the ministry of intelligence, not by rogue officials but by Iranian diplomats. This is not a case where we can give the benefit of the doubt, look the other way, or hope for the best, do not deal with reality, is to invite further attacks and loss of life. There are several things that have happened and more that can occur. First, the commitment to justice by the German government, and cooperating with Belgian officials, has been an example of just what it is like for a firm democracy to be threatened. The professionalism of Belgian law enforcement and the first statements by the government of France, which of course would have been host to this terrorist act and France is no stranger to terrorism. The question is what happens now. First, my government is not without a potential role. Under the statutes of the United States, a terrorist action abroad which involves casualties of American citizens is prosecutable under American law all of our terrorist statutes. On July 23, a letter was sent to Secretary Pompeo, Secretary of State of the United States, by a group of individuals who were present in the June 30 rally, reminding the secretary of state that, in a quote, as American citizens, having potential victims of the state generated the terrorist attack. We called the United States government hold Iran accountable, apply punitive measures, identify the Ministry of intelligence and security as a terrorist organization, work congressional mandate the foreign terrorist organization ACT is defined by an applicable standard. Second, and I quote bearing in mind that many American dignitaries and tens of thousands of people from multiple nations were present this venue. We urge the Department of Justice to consider opening an investigation on this matter under the criminal and terrorist statutes of the United States and quote. This could, of course, include after prosecution in French or Belgian, extraditing the defendants to the United States for prosecution again, under our similar statute. This letter was signed by the former speaker of the House Newt Gingrich, former mayor and presidential candidate, Rudy Giuliani, former ambassador to the United Nations, Bill Richardson, former attorney general of the United States, Michael Mukasey, a former F.B.I. Director, Louis Freeh, Frances Townsend, the former homeland security adviser to President Bush and a variety of other American officials who were present at the June 30 rally. I recognize, that as a large nation with considerable resources, taking a firm position against the government of Iran has economic costs. I recognize, that because of the nuclear accord taking a strong position against the government of Iran has political costs. What are the costs of doing nothing!? The government of Iran is watching. Silence invites more attacks. A policy of appeasement, but ensures more terrorism. There may be financial contracts at issue. But do we really weigh that against the lives of European citizens or those who would speak freely!? At this point in the history of the great democracies of Europe, to be intimidated by a religious dictatorship in Tehran!? Is this what one hundred years of restoring universal democracy has created, on our watch!? Every dictator and despot in the world that would like to protect their power over their people are also watching if Iran can kill. As the Russians would kill. In the streets of Europe, the tractors, freedom fighters, expatriates all, then why not a host of other nations!? Why not intimidate them all!? Iran is not just being tested here. So is the European Union and NATO and the United States. This is a defining moment. Our law enforcement agencies have acted bravely, so are the justice ministries, so yesterday to the governor of France. Now we wait. Does everyone else follow or remain silent? The first action, of course, is that the evidence is overwhelming. Two things cannot be true. An Iranian diplomat cannot travel through Germany, in route to a rally in Paris, transporting explosive devices to kill European, American citizens that can’t be true, as is now being alleged by Belgian officials, confirmed it appears by German and French officials. And the Ministry of Intelligence of Iran, not be a foreign terrorist organization. If the Ministry of Intelligence is not a foreign terrorist organization then Iranian diplomats who have been arrested and extradited should not be prosecuted. If they are to be prosecuted and extradited the Ministry of Intelligence of Iran must be designated as a foreign terrorist organization. Both cannot contradict. That is a challenge to your governments and mine. We’re waiting. I am not going to put myself in the unusual position, of advocating the policies of Donald Trump. He is not of my party, is not of my philosophy, he did not get my vote. But because Donald Trump may be wrong in some things he is not wrong on all things. I will respect your own government in your own sovereignty to reach your own judgment on the Iranian nuclear accord. But I would challenge you with this, even if you disagree with my government and me on the Iranian nuclear accord, you can reach your own judgment on the issue of economic sanctions against the Iranian regime. We can still find common ground. There is so the case of this pattern of the Iranian government using of resources for terrorist attacks. There is the assassination of 3.400 arraigning citizens. There’s the imprisonment of tens of thousands for exercising political rights. The case for sanctions against the Mullahs and the regime in Tehran is overwhelming. The United States should not be in the position of having to act alone. This is not our security alone. It is all of our security. It is not an offense against us or our principles, it is a defense against all of you and your principles. And the sanctions are working. The noose is tightening. Iranian people are on the streets of cities and towns across Iran, risking their lives, and giving their lives by the thousands, to end this tyranny. What do they ask of us? No one asks you to fight. No one asked you to shed blood. They asked you to forego some contracts. Buy the oil somewhere else. Spend your money in another country. You don’t have to help, just don’t hurt. That’s the challenge to us as citizens. The challenges to our governments are, designate the Ministry of Intelligence as a foreign terrorist organization, TO DAY, TO DAY. I urge you behalf of so many coevals among me just do not join to mullahs’ regime to prevent us from freedom and justice. As Mr. Torricelli said, we do not demand you to help us, just do not stand along with criminals. Don’t permit them to hurt Iranian opposition in your country. close down mullahs’ embassies, not just for the security of expatriates, for the security of your citizens.